The familiar, to all citizen of Plovdiv, building of Hotel SPS has turned into a symbol of the city. 50 meters tall with 16 floors, the hotel definitely catches the attention of passers-by. An important accent of the massive building is the metal cube placed on the roof. The printed vinyl banner on the cube proudly announces the logo of the hotel as it overlooks the future European Capital of Culture from a bird’s eye view. The entirely renewed Hotel SPS offers its guests perfect conditions and service to enjoy their visit. There you will find everything you need to organize your business gatherings – congresses, training, presentations, and others. Besides that, you can enjoy the outside pool, lobby bar, and the a-la-cart restaurant. The vinyl banner was stretched over the entire cube. As a part of the complex design and the renewal of the cube, we had to completely change the look of the previous outdoor advertisement. But at this height, the first thing we did was to ensure the safety of the sign. At 50 meters height, the climate changes fast, which is one of the main reasons why we had to look for the best and most secure technology – aluminum and vinyl banner. That provides the system with additional strength. The advantages of the aluminum systems is that they ease the assembling and the mounting process even on large signs such as the one of hotel SPS. The profile allows you to create corner signs with elegant edges with non-visible rivets and imperfections caused during assembly. In combination with the 3M Panagraphics III, the durability is guaranteed. For the graphic of the logo, we used 3M 2330 Translucent film. The high-quality illumination was provided by the Korean company G.O.Q. LED, which have proven their effectiveness. 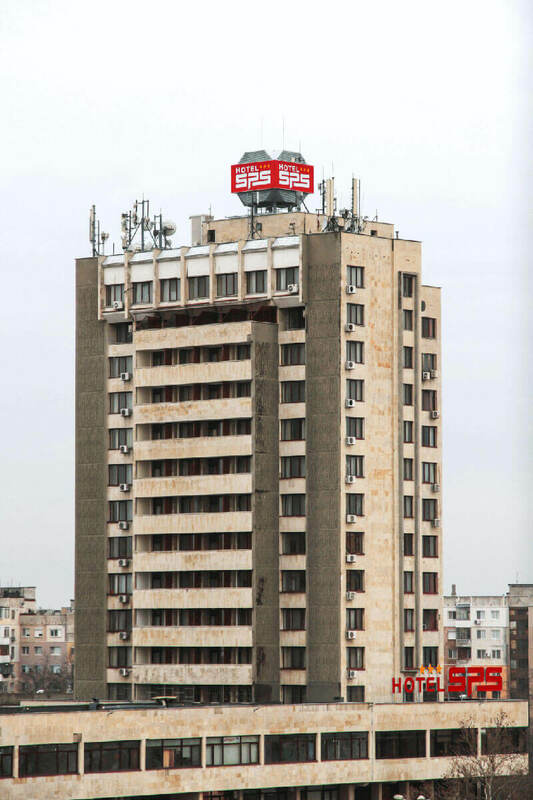 As a result of our hard work, hotel SPS received a lasting advertisement.